GOAL! West Ham 1-1 Chelsea - 56 min: Gary Cahill pulls one back for the visitors. Game on! GOAL! Leicester City 1-0 Crystal Palace - 60 min: Vardy scores his tenth goal of the season to put the Foxes ahead! GOAL! Aston Villa 1-0 Swansea - 62 min: Ayew puts Villa up against Swansea. That could be such an important goal for the home team if they manage to hold onto this lead. 7 - Jamie Vardy has become just the 8th different player to score in 7+ consecutive Premier League appearances. Star. GOAL! Aston Villa 1-1 Swansea - 68 min: Sigurdsson pulls one back for Swansea. GOAL! Stoke 0-2 Watford - 69 min: Watford start to pull away thanks to Almen Abdi's first Premier League goal. GOAL! West Ham 2-1 Chelsea - 79 min: Carroll has put West Ham ahead again with 10 minutes to go! GOAL! Aston Villa 1-2 Swansea - 87 min: After going 1-0 down, Ayew scores a late second goal to put the visitors ahead. 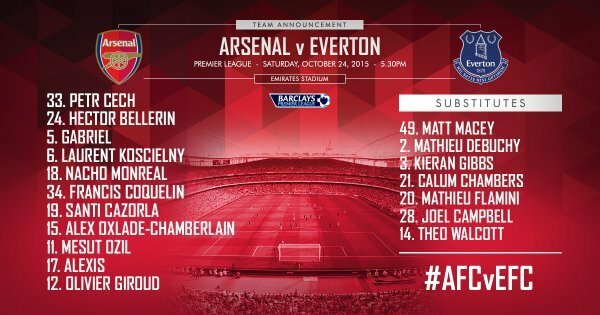 Arsenal: Cech, Bellerin, Gabriel, Koscielny, Monreal, Coquelin, Cazorla, Oxlade-Chamberlain, Ozil, Sanchez, Giroud. Subs: Macey, Debuchy, Gibbs, Chambers, Flamini, Campbell, Walcott. 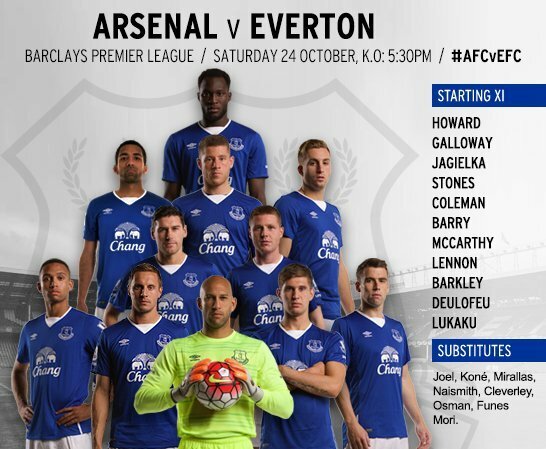 Everton: Howard, Coleman, Galloway, Jagielka, Stones, Barry, McCarthy, Lennon, Deulofeu, Barkley, Lukaku. Subs: Joel, Kone, Mirallas, Naismith, Cleverley, Osman, Funes Mori. 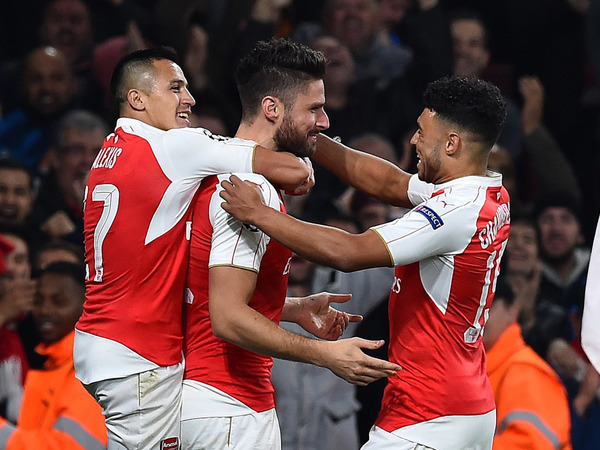 Arsene Wenger has his say: "After a big game on Tuesday night...we need to keep the same level of urgency and desire. You have to prepare 100% and earn the right to win in the Premier League." Roberto Martínez has his say: " The weekend was a really disappointing result but we've been looking to get rid of that feeling. "I feel this game is going to need a lot of pace - having Deulofeu and Aaron Lenon on pitch will help with that...We need to find a really good start in the game." Everton are winless in their last 21 league and cup games away to Arsenal - an away streak that has stretched the entire 19 years of Arsene Wenger's reign. Their last victory away at Arsenal was in January 1996, when Everton came out 2-1 on top. Here we go! The players are out on the pitch, the dramatic music has started, we're seconds away! And that's the whistle, we're off! 1 min: Everton work it down the right and it looks like it's taken a deflection for a corner but the ref blows for a goal kick. 3 min: Sanchez tries to muscle his way through three Everton defenders down on the left flank - he's clearly been hitting the gym as he finds his way past two but fails to beat the third. 4 min: Giroud closes down Howard as he hesitates on the ball - he gets the kick off but it takes a deflection off Giroud and the ball finds its way into the feet of Sanchez who attempts to feign a shot but Stones gets a foot in and the ball is cleared. 7 min: Some speedy running from Oxlade-Chamberlain down on the right earns Arsenal their first corner. Cazorla whips the ball in and it's met by a leaping Giroud but he fails to get a clean enough contact and he heads the ball past the post. 9 min: Arsenal are looking to really stretch their legs and are dominating possession in the middle. They've earned themselves another corner which finds Gabriel but he can't quite get his full head behind the ball and it heads out for another corner. 12 min: The Ox picks the ball up on the right-hand side of the box and plays a penetrative ball through into the box only for it to be forced back out. It's whipped straight back in but is headed out for an Arsenal corner which doesn't pose any real threat. 14 min: Sanchez plays a ball from deep over the back four to Giroud. With Stones biting at his heels, it ends up hitting him on the back of the head and falls into the feet of Ozil. It looks like he's through on goal but the ref calls the play back for what appears to be a Giroud foul on Stones. 17 min: The game is certainly warming up now with Everton finding their feet ever so slightly. They're holding onto the ball a bit more and finding those channels out wide. An Everton throw in into the Arsenal box looks to threaten Cech but Lenon concedes a foul on Gabriel and the danger is cleared. 22 min: Ozil drives into the centre of the park from the right flank and plays a deceptively clever reverse ball into the box, picking out Sanchez. Arsenal gain yet another corner from it but again it's wasted. 24 min: Coquelin comes in late against Galloway and brings him down in the centre of the pitch. He's found his way into the book with a yellow card but it seems a tad harsh, especially at this early stage in the game. 26 min: From an Everton corner, the ball is played into the box and skims across the face of the goal but Cech fails to properly clear it, punching it only as far as Stones. He lashes at the ball but ends up slicing it and the ball heads out for a goal kick. 30 min: Again, Howard lingers far too long on the ball and is almost closed down by the Ox. Howard subsequently ends up handing possession back to Arsenal. 32 min: Ozil whips in a free kick 25 yards out. It just glances over an out-stretched Koscielny and heads out for a goal kick. GOAL! Arsenal 1-0 Everton - 35 min: Giroud scores! GOAL! Arsenal 1-0 Everton - 35 min: Ozil finds himself in acres of space down on the right flank. He drifts inwards and floats in a tantalizing ball which floats over the heads of the Everton back four and is met by Olivier Giroud. With his back to the goal, he climbs to meet the ball and nods it in over Howard. GOAL! Arsenal 2-0 Everton - 37 min: Koscielny scores! GOAL! Arsenal 2-0 Everton - 37 min: Two goals in the space of 100 seconds! From an Arsenal free kick on the left hand side of the box, Cazorla whips in a fast ball into the box and finds the head of Koscielny who, having lost his man, nods the ball into the back of the net. It couldn't have been easier. GOAL! Arsenal 2-1 Everton - 43 min: Barkley scores! GOAL! Arsenal 2-1 Everton - 43 min: Barkley finds himself with the ball 25 yards out from the Arsenal goal. He's lacking in support and takes the shot which, lucky for him, takes a deflection off the leg of Gabriel and finds its way into the top right corner of the goal. There was nothing Cech could do about that one. 45 + 1 min: Deulofeu beats Gabriel with a fantastic touch to take it round him but is brought down in the process. The ref continues play but Deulofeu is absolutely fuming and clearly feels as if he deserved a free kick there.